A recent conversation with a customer in Texas about refrigeration air dryers led me to think about a pattern we have with our maintenance calls. As you know, every press in every dry cleaning facility operates by air-activated cylinders to either raise and lower or close and open ironing heads, transfer forms, and such. Each one of those cylinders has a rubber O-ring that is affected when moisture mixes with the lubricant at the seal. The problem that many facilities experience is that the air going to the equipment has too much moisture, which ultimately creates maintenance problems and costly repairs. Unfortunately, many folks tend to ignore this issue; however, with just a little planning and effort, this issue could actually not even be an issue at all. Here are my three suggestions to help remedy the problem. 1. 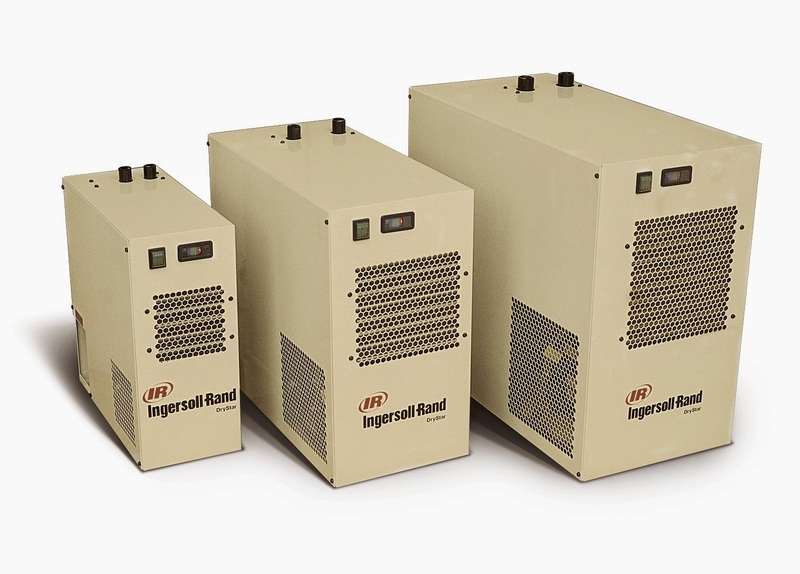 Installing your air compressor in the boiler room seems like a logical choice given the amount of noise it produces; however, the boiler room has both a higher temperature and higher humidity than the surrounding area. Instead of taking in ambient air from that humid environment, we suggest that you pipe the intake to pull air in from outside the boiler room. 2. Install a refrigerated air dryer. Here’s how it works – warm wet air enters the dryer and is cooled down. The moisture that was in the air condenses to water, and that water goes into a water separator bowl and filter. What’s left is dryer air, which is reheated to room temperature to keep the outside of the pipes from sweating. 3. Your last line of defense is to install an oil water separator on each press. This device is designed to keep water from mixing in with the lubricants and getting in your rubber seals and valves, ultimately leading to premature valve failure. The photo below is of a combination separator/filter/regulator. Protect your investment. If you are having water vapor issues, contact us at tristatelaundryequipment.com or call us at 866-885-5218. We are happy to help.